John Skinner was inducted as a Fellow of the Australian Hydrographers Association on Tuesday 13 November 2018. John started his career in Latrobe Valley Water & Sewerage Board in 1974. Bill Barratt recruited him as a trainee Hydrographer in 1975, where he worked with Max Hayes and later Alex Springall. The next year, John moved to Papua New Guinea overseeing operation and management of the Government’s network of hydrometric stations throughout PNG. Then in 1984 he joined Ecowise as a Consulting Hydrographer and continued to deliver Water Resources consultancy projects in Australia and overseas. John was later appointed Group Manager, Monitoring and Technical Services (MATS), Ecowise Environmental and during his time, it grew from a relatively small hydrographic group of specialists based out of Canberra, to a National Company with more than 10 regional offices. With his extensive hydrometric background he was recruited by the Water For Rivers program delivering water efficiency projects for the Murray and the Snowy Rivers. He continued work on water efficiency programs with the State Water Corporation and also Coleambally Irrigation with ongoing reviews of hydrometric measurement techniques and water delivery procedures and technologies. 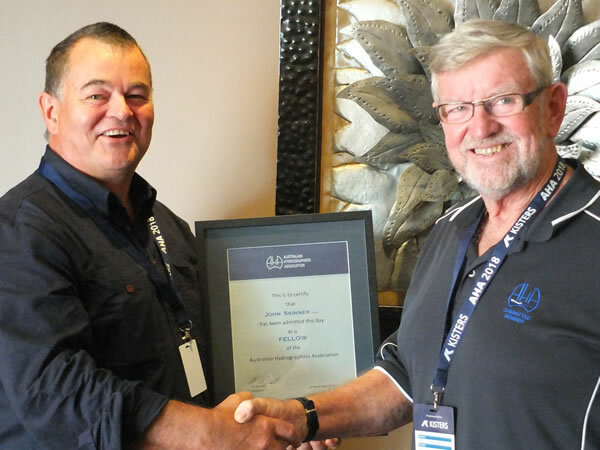 In 2016 John took up a role as training consultant for AHA, delivering the Introduction to Hydrography course and working with the Riverina Institute of TAFE NSW delivering the Diploma in Water Industry Operations (Hydrography). John has been an active member of the AHA since its inception and is well recognised for his contribution and his ongoing support including his role in assisting with training and assessment of the next generation of Australian hydrographers. Congratulations John, for your significant contribution to the profession and to the AHA and on your appointment as “Fellow of the Australian Hydrographers Association”.